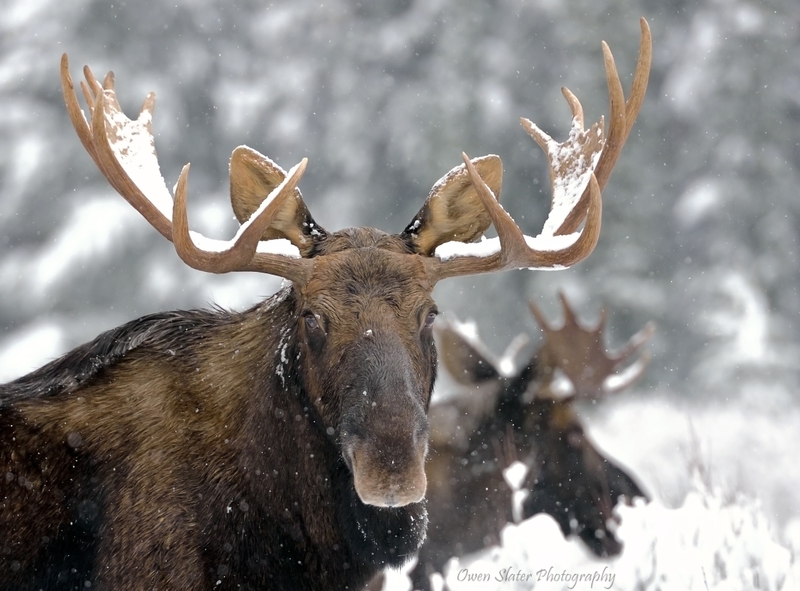 It’s relatively rare to see moose in the Rockies. I see more wolves and bears than I see moose, but late fall and early winter always seem to be good times to run into them. You would think it wouldn’t be hard to find them when they weigh around 500kg and stand about 2.5 meters tall at the shoulder, but this bull was only given away by his prominent set of antlers while he bedded down during a snow storm. Two other similarly camouflaged bulls were resting nearby, but when they got up and started moving towards the larger bull it didn’t take him long to get their attention. He stood up, flattened his ears and strutted over to them. Bull moose will posture before ever sparring and the smaller bulls quickly realized they had no chance, put their heads down and got out of his way. Satisfied with his work, the big bull turned and had a look at me. I had placed myself next to a large tree just in case I needed to make a quick escape, but I guess he didn’t feel I was even worth trying to scare off since he just turned around and went back to feeding on willows. I was just fine with that! The New Year has not resulted in a slow down in my opportunistic backyard wildlife photography and in fact it seems to have picked up a bit! This time it was the largest cervid in North America to make an appearance and while the photo isn’t great, it is was more to document the sighting than anything! 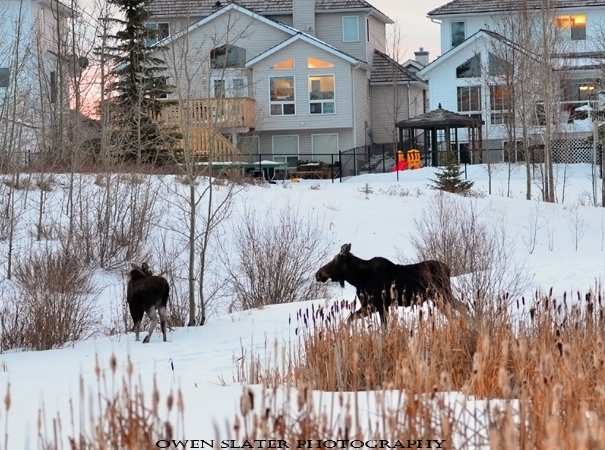 I was enjoying the beautiful morning sunrise in Calgary while cooking breakfast when I looked out the kitchen window and noticed this cow and calf moose making their way down the path to the backyard pond! I immediately sprang into action, racing around the house throwing on warm clothes and my boots while grabbing my camera and coat hoping they would still be there when I got out the back door. Sure enough, they had stopped where I last saw them to nibble on some shoots. I walked down the small hill to the pond and managed to snap off a few photos before the mother got spooked by something and trotted across the frozen pond with her calf in tow. By this point, several cars and pedestrians had stopped along the road to take in the rare event. As everyone looked on, the moose made their way up the bank and down the sidewalk ignoring the backlog of traffic before disappearing out of sight. Every year a few moose end up in Calgary. They make their way into the city by travelling along rivers and park systems. Thankfully, these two appeared to know their way around the neighbourhood and successfully navigated all the city traffic, houses and pedestrians on their way to more suitable habitat on the outskirts of town. Those that wander too far into the city require ‘assistance’ from the local Fish and Wildlife officers, who sometimes need to sedate and move the moose if they get stuck in someone’s backyard or wander into the downtown core. It will be hard to top this latest backyard wildlife sighting but it left me wondering what wildlife will be next to show up at my doorstep? Happy New Year! Thanks for stopping by and for those returning, thanks for your support in 2012! It was my best year to date with visits from over 110 different countries! I had several amazing wildlife experiences resulting in a few of the photos you see here. It will be hard to top 2012, but I’m looking forward to seeing what develops in 2013 and sharing my photos and stories with you here. On one of my recent trips to the mountains I watched a pack of wolves slowly wander along a frozen river and took in a beautiful sunrise as the moon set over the mountains. 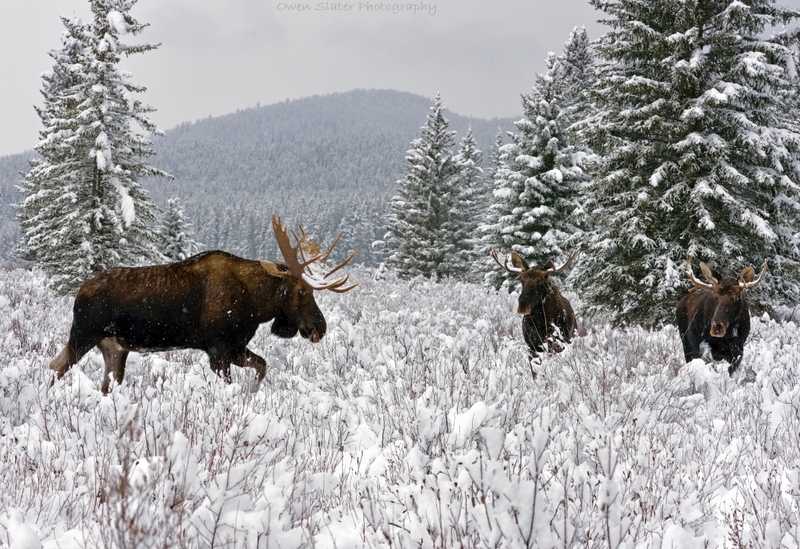 I also came across these two bull moose in a large meadow surrounded by mountains. 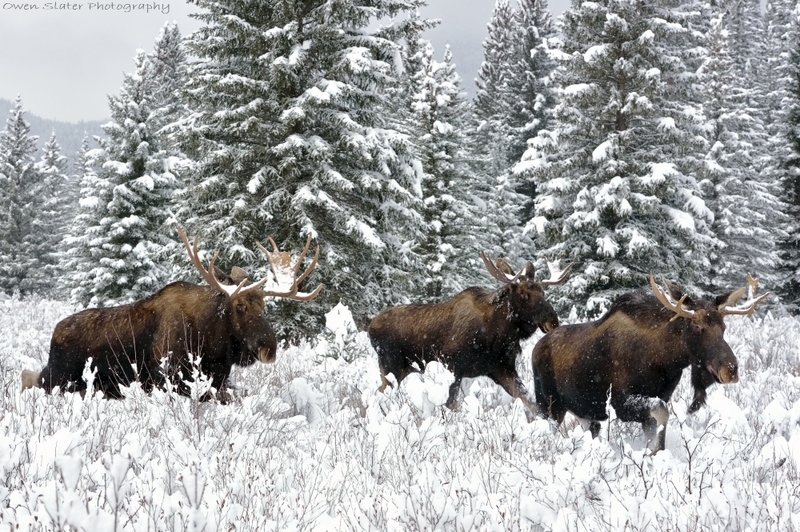 Moose in the Bow Valley ecosystem are the hardest of the ungulates to find and it’s even more rare to see more than one adult together at a time. However, this past year I have seen more moose than ever before and there is evidence to suggest that their numbers will steadily increase in the park over the next decade (as long as rail and vehicles strikes can be minimized). These two large males just came through the rutting season. Just before the start of the rut, their testosterone levels surge and they essentially become the human equivalent of an Olympic caliber athlete on performance enhancing drugs. For over a month they battled other males, wander large distances to find reproductively active females and hardly eat a thing, all for the opportunity to breed. The end of the season is marked by a gradual decrease in their testosterone levels. They no longer view each other as competition but instead, periodically seek out the company of other males and forage together. These two spent the day trying to replenish their energy reserves by eating and resting together in a large meadow. The mountain in the background is known as Castle Mountain, which on its own is one of my favourite mountains to photograph in Banff National Park. Add in a sunny day with clear skies, a great vantage point and a couple of moose and it was the perfect recipe for getting a good photograph. Continuing with the theme of unusual animal sightings, this one occurred earlier this year. 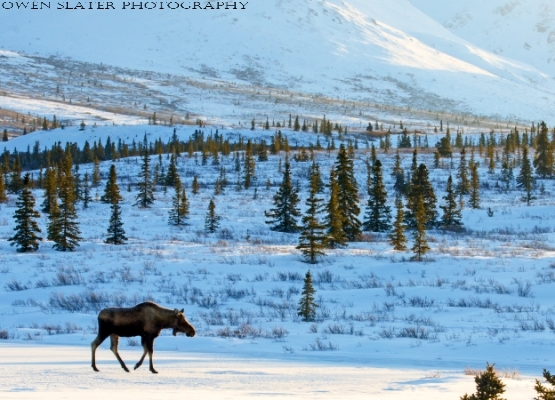 Unlike in Newfoundland, moose generally live very solitary lives in Alberta. Prior to this day, the only time where I have seen more than two unrelated animals together was during the breeding season. So it was very surprising to be driving along a back country road and come across this scene! We immediately slammed on the brakes, grabbed our cameras and started taking photos. 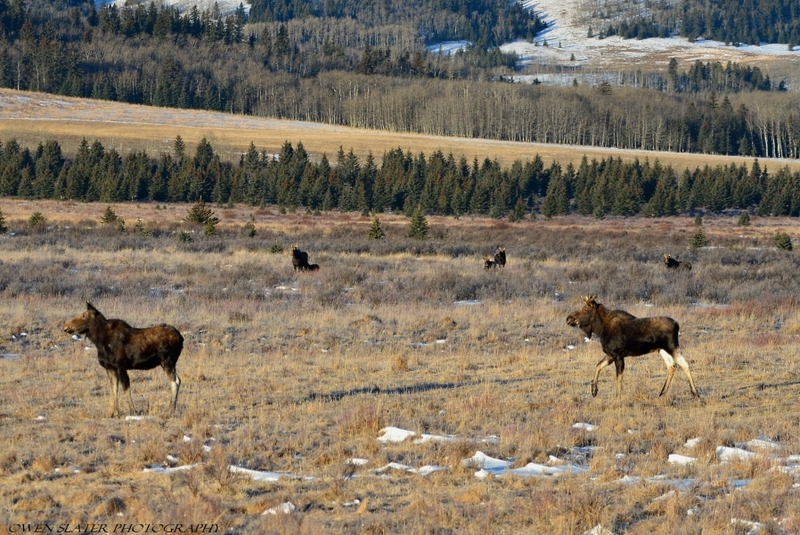 In total there were 11 moose in this one meadow, with 7 in this frame. There were two mothers with calves and several yearlings and two-year olds. With hunting season just over they were still a bit skittish, so we grabbed a few photos, got back into the car and continued on. My favourite photo from my recent trip up to Jasper. During the trip I saw numerous moose, but usually they were hiding amongst the trees which made getting good photos rather difficult. On the last day, I spotted this female along the shores of Medicine Lake at sunrise. The lake was at the lowest I have seen with the deepest part of the lake only a few feet deep. This allowed the moose to get to vegetation at the bottom of the lake that it wouldn’t normally have access to. I spent a few hours photographing this female as she moved along the shore and into the lake. However, it wasn’t until I climbed up and was heading back to my car that I turned around and noticed this great angle and back-lighting. A few cars drove by as I waited for the moose to turned a bit to allow me to get a profile shot. I figured the other people either had seen a lot of moose before and weren’t interested in stopping, or they thought it was just another rock partly submerged in the lake! With that in mind I included the foreground rocks in the photo which I think makes it a much more interesting image. Just like clockwork it took all of 5 minutes of sitting along Akamina lake before I heard an animal moving through the forest on the opposite side of the lake and this moose appeared along the water’s edge. She moved around the lake towards me feeding along the way. Once she finally figured out that I was there she only briefly looked at me before going back to feeding on the plants around the lake. After about 30 minutes of feeding by the lone female moose a yearling bull moose joined her in the water to feed. Mom waiting for her calf to finish shaking the water off before moving on to feed farther down the lake. This particular moose is not bothered by my presence and I have learned that if I make myself visible to her instead of trying to hide in the trees she gets much more relaxed and will go back to feeding without paying much attention to me (except when the shutter makes a noise and then she will point one ear towards me, as you can see in this picture). About an hour after taking the picture of the elk I made my way to Akamina Lake hoping to find some moose in the morning fog. When I got out of my car and was getting my equipment together I could hear a moose calling to her calf and I knew I was going to have more good luck. Sure enough, by the time I hiked down to the lake the calf had joined her mom and was standing along the shore as the mom fed from the vegetation on the bottom of the lake. This moose came down to Akamina Lake both days that I visited it. She would leave her twin calves (photos to come later) in the forest while she fed on the water plants and got away from the bugs. 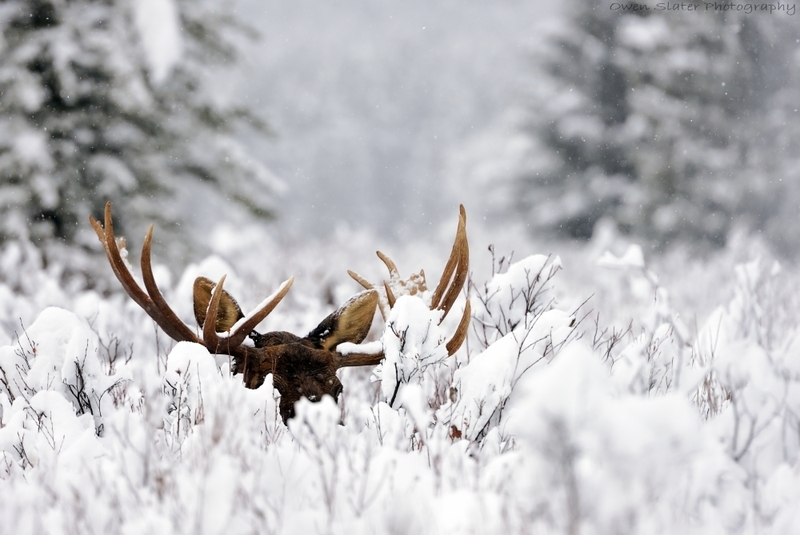 In this photo there is a dragonfly near the ear of the moose. The dragonfly was feeding on flies that were forced to fly off the moose as she almost completely submerged in the water. I came across this mother and her calf along the shore of a lake. The calf, no bigger than the mom’s head must have been born that night as it was still unstable on it’s feet and had a very hard time walking through the tall grass. The mother would try to call and lead the calf away but the calf was still not strong enough to follow. I left after a short time and returned to the same spot later that afternoon but they had moved off into the forest.